In those intervening years, Abbot Enda, whom Roseman drew in 1978, had retired and Father Finnian was elected abbot of Mellifont Abbey. He is seen here in the superb drawing Abbot Finnian at his Desk, 1983, National Gallery of Ireland, Dublin, (fig. 2). The ascetic abbot bent over his desk and absorbed in writing evokes an image of a Celtic monk and scribe from a distant past. Abbess Imelda and Sub-Prioress Sister Paula, a graduate of Dublin Art College, graciously received Roseman and Davis. Due to the artist's work, Roseman was given the extraordinary privilege of being taken inside the cloister to draw the Trappist nuns. The Sub-Prioress with several sisters asked the artist to include in his work a drawing of their Abbess. Roseman was pleased to do so as Mother Imelda was very encouraging of his work. Sitting for the artist, Mother Imelda made her own commitment to Roseman's work on the monastic life. Portraiture comprises an important part of Roseman's oeuvre. The British Museum, London, conserves the excellent portrait drawing Mother Abbess Mary Imelda, (fig. 7). Twice re-elected as Abbess of Glencain, from 1965-1983, Mother Imelda guided the Trappist community through the historic changes of the Second Vatican Council. 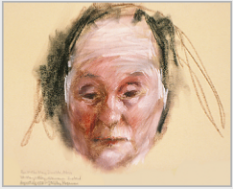 Roseman has beautifully rendered with chalks on beige paper the portrait of the Irish Abbess, her delicate, facial features set off by her white wimple. With the nun's veil summarily indicated with bistre and black chalks, the face of Mother Imelda with a benevolent regard is central to the composition of the portrait. Roseman and Davis received a deeply moving letter in August 1978 from Abbot Enda, named after the sixth-century Celtic saint and abbot who is regarded as the earliest founder of monasteries in Ireland. as it showed how much we have in common before the Lord. as I have your welfare and happiness very much at heart. Roseman and Davis were heartily welcomed by Abbot Enda, a kindly man in his early seventies who was a founding member of new Mellifont; Father Finnian, the guestmaster; and Father Thomas, a Latin scholar and the abbey's archivist and librarian. 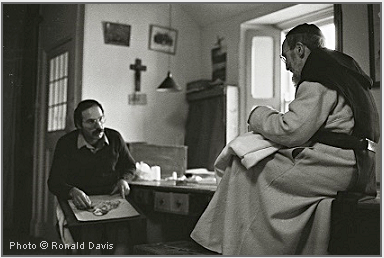 The monks' enthusiasm for the artist's work and their expression of friendship to Roseman and Davis were sustained in correspondence and reaffirmed in the monks' welcoming them back to Mellifont in the winter of 1983. 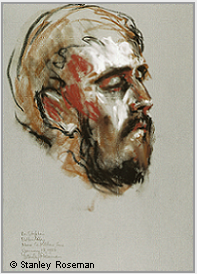 The National Gallery of Ireland also conserves Roseman's superb drawing Abbot Finnian at Vespers, 1983, (fig. 3), rendered in a harmony of lines and tones in black and bistre chalks. The pyramidal composition is complemented by the leitmotif of triangular shapes and forms, as in the rendering of the monk's hood and the folds of his cowl. Abbot Finnian, turned towards the altar, kneels in prayer at Vespers. What is especially relevant here is that those marvelous Celtic manuscripts, including the Book of Kells, Book of Dimma, and Book of Armagh, all from the eighth to ninth centuries, were produced in monastery scriptoria. The Boston Globe published laudatory accounts of Roseman's work in a feature news article, 1979, titled "Monks' life through art" and a cover story, 1981, in the Boston Globe Sunday Magazine. Father Finnian thanks Davis for the enclosures he sent about Roseman's work and thoughtfully mentions that if they are not traveling by car, there is good public transport from Dublin. Father Finnian closes his letter: "Looking forward to meeting you and your friend." Roseman drew the impressive portrait of the elderly Irish Trappist nun Sister Immaculata, (fig. 8), at St. Mary's Abbey when the artist returned to Ireland in winter of 1983. 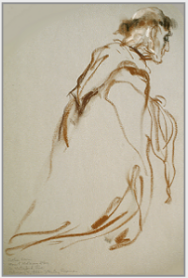 Roseman's drawings on the monastic life brought him the honor in 1983 of being the first American artist to have a one-man exhibition at the Graphische Sammlung Albertina. 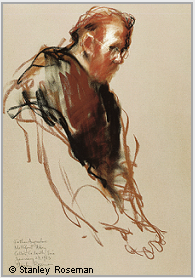 From the renowned collection of the Albertina is the powerfully expressive portrait of Brother Stephen, whom Roseman drew in choir at Bolton Abbey during the artist's return to monasteries in Ireland in the winter of 1983, (fig. 11). 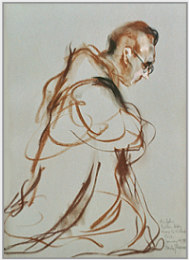 Brother Stephen, Portrait of a Trappist Monk in Prayer further exemplifies Roseman's virtuosity as a draughtsman. Bold contours and sculptural modeling of the masculine facial features with luminous highlights and warm shading are in dramatic contrast to the young Irishman's black moustache and beard. 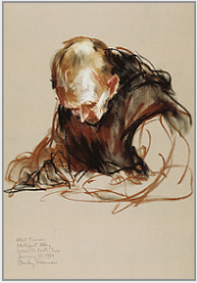 In this portrait of a Trappist monk in prayer, the artist has created a drawing of great spiritual intensity. Roseman and Davis' journey to Irish monasteries included Mount Melleray Abbey, where they were warmly welcomed that summer of 1978 and again on their return in winter of 1983. From Roseman's work at Mount Melleray is the fine drawing Prior Kevin in Choir, (fig. 5). With fluent lines of bistre chalk, the artist has depicted the ascetic monk in his voluminous cowl as he kneels absorbed in prayer. "The reestablishment of monastic life at Mellifont dates from the founding of a new monastery in 1938 on the property of the former Abbey, whose architectural remains give a sense of Mellifont's importance in the history of Irish monasticism. The present-day Mellifont Abbey is of the Order of Cistercians of the Strict Observance, a branch of Cistercian monasticism also known as the Trappist Order." "The twelfth-century, former Cistercian Melleray Abbey, in Brittany, had been reestablished by Trappists in the nineteenth century and was a refuge for Irish monks. "Celtic monasticism in the sixth, seventh, and eighth centuries adhered to a rigorous spiritual asceticism with long hours devoted to prayer and meditation, as well as to study and work. Thus it seems natural that Trappist monasticism would become deeply rooted in the contemplative life in Ireland." The portrait Sister Immaculata was acquired in 1986 by the Teyler Museum, in the Netherlands. The Teyler Museum is renowned for its collection of master drawings from the Italian Renaissance, with works by Michelangelo and Raphael, and from the seventeenth-century Dutch school, notably drawings by Rembrandt. "The name 'Mellifont,' in Latin 'Fons Mellis,' meaning 'Honey Fountain,' was indeed an appropriate name for the monastery, for Mellifont Abbey gained numerous vocations and was to become the fountainhead of Cistercian monasticism in Ireland. Invited by Abbot Colmcille O'Toole in the winter of 1983, Roseman took up his paper and chalks to draw the Trappist monks at Mount St. Joseph Abbey, Roscrea, County Tipperary. The monastery was founded in 1878. Roseman writes: "Monastic life in Roscrea dates back to a Celtic monastery that was founded by St. Cronan in the seventh century and produced the treasured Book of Dimma (c.eighth century), a small, portable Gospel book that is thought to have been for study purposes as well as for pastoral use." Roseman's work from Mount St. Joseph's Abbey includes the excellent drawing in the collection of the monastery Abbot Colmcille in Choir. The drawing is presented on the page "Ora et Labora - Prayer and Work," Page 2. "The founding of Bolton Abbey, in County Kildare, in the twentieth century," writes Roseman, "brought monastic life back to a region steeped in monastic history. Some five miles east of the present monastery are the remains of the Cistercian Abbey of Baltinglass, founded in 1148 as a daughter house of Mellifont. A few miles south of Bolton Abbey, at Castledermot, a round tower and two Celtic stone crosses stand where once had been St. Dermot's monastery, a ninth-century foundation belonging to the eremitic Célí Dé reform movement that flourished from 750 to 900. Two miles north-west of Bolton Abbey is the famous High Cross of Moone, a seventeen-foot tall, stone cross, with Biblical depictions, that dates from the eighth to ninth century and today identifies the site of the former Celtic monastery of Moone, founded in the late sixth century. Some five years later, the artist and his colleague were warmly welcomed back to Bolton Abbey. With renewed enthusiasm, Roseman took up his paper and chalks again to draw the monks in choir, in the refectory, and at work and study. The artist also drew several impressive portraits of the monks, including Brother Anthony, the amiable and caring guestmaster, (Private collection, Switzerland). Presented here is the beautiful drawing Brother John kneeling in Choir rendered with curvilinear strokes of bistre and black chalks and touches of white, (fig. 10), collection Bolton Abbey. Brother John, a founding member of the monastery, was a carpenter and did much of the work on the abbey church with its attractive wood-paneled choir, wood vaulting, and parquet floor of the altar. Roseman's work brought him to Bolton Abbey in summer of 1978. Abbot Benedict Kearns and the Community heartily welcomed Roseman and Davis and were greatly encouraging to the artist in the early months of his work. Mount St. Joseph Abbey opened in 1905 a secondary school, Cistercian College. Abbot Colmcille graduated from the Abbey's school, as did Father Hugh, a cantor and the subject of an impressive portrait drawing by Roseman, (Private collection, Switzerland). The Graphische Sammlung Albertina, Vienna's world-renowned collection of master drawings, conserves the superb portrait Brother Peter, 1983, (fig. 9). 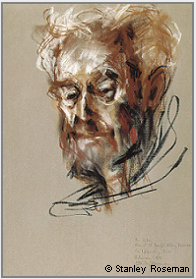 In the portrait of Brother Peter, Roseman complements linear passages describing facial features with the blending of chalks to give warmth to shadows and a silvery gray texture to the monk's beard. Vigorous strokes of white chalk add highlights to the cheeks, brow, and hair. The artist completes this engaging portrait with several calligraphic strokes of black chalk indicating the black scapular worn by the Trappist monk who looks out from the composition with a friendly regard. Father Augustine in Choir, reproduced at the top of the page and here, (fig. 4), is a compelling work of an Irish Trappist monk whom Roseman drew during his sojourn at Mellifont Abbey in 1983. 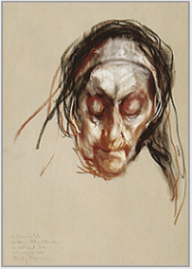 The drawing of Sister Immaculata exemplifies Roseman's painterly use of the chalk medium for portraiture and the artist's great ability to express the individual identity of the sitter. Here, Roseman creates a beautiful harmony of cool, translucent skin tones and warm shading in rendering the elderly woman's face with deep set eyes and a peaceful countenance. "We were filled with excitement,'' recounts the artist, "for our first destination was Mellifont Abbey, which traces its history to 1142 and the founding of the first Cistercian monastery in Ireland." The following is from a text Roseman wrote on monasticism and on his work in monasteries to accompany his paintings and drawings. (London: Batsford Ltd, 1976), pp. 165, 167. 3. Louis J. Lekai, The Cistercians (Ohio: Kent State University Press, 1977), pp. 40, 271.
and National Gallery of Ireland, 1983), p. xvii. 6. Treasures of the Library - Trinity College Dublin, edited by Peter Fox (Dublin: Royal Irish Academy, 1986), p. 49. 7. Eoin de Bhaldraithe, The High Crosses of Moone and Castledermot (Moone: Bolton Abbey, 2009), p. 7. "Mellifont was founded by St. Malachy (c.1094-1148), Bishop of Armagh, who was a friend of his older contemporary St. Bernard, Abbot of the Cistercian Abbey of Clairvaux, situated in a forested valley along the River Aube in northeastern France. Clairvaux was a daughter house of the Abbey of Cîteaux, whose founding in Burgundy in 1098 marks the beginning of the Cistercian Order. "With encouragement from his friend Bernard and with enthusiasm for the Cistercian life, Malachy chose a similar site for the future Irish Cistercian monastery, along the River Mattock in a secluded valley some forty kilometers north of Dublin. Irish novices who received their monastic training at Clairvaux returned to their native land and were joined by French monks who came to help the nascent community establish Cistercian observance of prayer, work, and study. 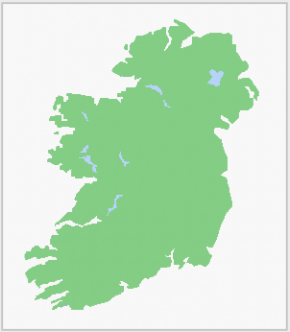 "During the twelfth and thirteenth centuries, the growth of Cistercian monasteries in Ireland included Anglo-Norman foundations, such as Grey Abbey on the Ards Peninsula; and Tintern Minor and Dunbrody, along the south coast in Co. Wexford. The number of Cistercian abbeys reached over forty by 1536 when began the dissolution of religious houses throughout the British Isles under Henry VIII. "Holy Cross, a former Benedictine abbey along the River Suir in Co. Tipperary, was resettled in 1180 by Cistercian monks from Monasteranenagh. With the founding in 1272 of Hore Abbey at the foot of the Rock of Cashel (Co. Tipperary), Mellifont's filiations totalled twenty-two. In the first year of his work on the monastic life, Roseman and his colleague Ronald Davis, with letters of invitation, made their first journey to monasteries in Ireland. Departing August 1978 from Mount St. Bernard Abbey in Leicestershire, where the artist had been working that summer, Roseman and Davis drove to the port of Holyhead, where they boarded a car-ferry to cross the Irish Sea to Dun Laoghaire, just south of Dublin. "Mellifont's first daughter house was Bective, founded in 1147, along the River Boyne in Co. Meath. Soon after, Mellifont founded Inislounaght, 1147, Co. Kilkenny; Boyle, 1148, Co. Roscommon; and Monasteranenagh, 1148, Co. Limerick; the three of which also founded daughter houses. Another filiation of Mellifont was Baltinglass, 1148, Co. Wicklow, whose four daughter houses include Abbeymahon, which founded Abbeystrowley, both in Co. Cork; and Jerpoint, Co. Kilkenny, which founded Kilcooly, Co.Tipperary. Father Augustine's fair complexion and red hair and beard are in striking contrast to his black scapular. The painterly use of the chalks is complemented with linear descriptions in bistre chalk to render the sleeves of the monk's tunic and his hands held reverently together. Roseman has created an eloquent drawing of the Trappist monk in prayer. Father Augustine was to be elected Abbot of Mellifont in 2004. Roseman has brilliantly captured the lively personality of this endearing monk with tousled hair and a rugged complexion from hours of manual labor out-of-doors, which, in the Trappist tradition, complemented the hours he devoted to the Divine Office in choir. Brother Peter had worked on a farm in his youth and resumed similar work on the Abbey's farm, a source of income for the monastery since its foundation. The monastic precept "ora et labora," "prayer and work," emphasizes the importance placed on work as an indispensable part of a life centered on prayer. 6. Stanley Roseman drawing Brother Michael, the tailor, in his workroom at Mount Melleray Abbey, 1983. 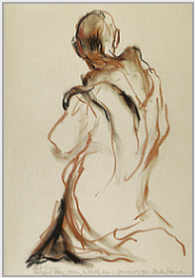 Praising Roseman's drawings as "impressive," the daily further states: "Roseman has captured the personalities of many individual monks while often managing to depict their lifestyles as well. . . . The artist's gray, brown, dark and light tones vary as subtly and surely as the monks who live out their discipline of prayer and work and meals in common." "The revival of monastic life in Ireland in the nineteenth century brought Irish monks from Melleray Abbey back to their native land. In 1832 the monks settled on a mountainous tract in County Waterford and took the name Mount Melleray for their new monastery.